Tori says, "Car travel is my passion!" We're not quite ready to declare total victory on Tori's car-sickness issues, but she has gone for 3 whole trips to town and back without throwing up in July. Maybe she is *finally outgrowing her car troubles. Maybe we finally found the right combination, dosages, and timing of meds. Maybe she loved going to agility class (for the first time) so much that it has helped her realize that the car can take her fun places. As a joke now, Tom likes to use his "Tori voice" to say, "Car travel is my passion!" which makes me giggle after 3 years of car struggles with our sweet girl. I'll write more about both classes soon, but on July 5, we had a holiday weekend family outing to a class where both of the puppy-girls tested for their AKC Novice Trick Dog titles. 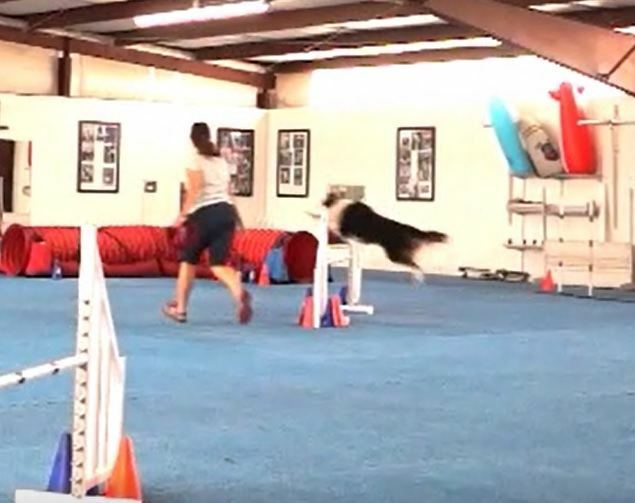 Then we stayed for our regular agility class, where I ran both girls for the very first time in class like that, and it was a hoot. Wait until you see the videos in later posts. Tori walked to the start-line and nailed it. You can hear Tom giggling because it was about the cutest thing ever to see her doing agility in public for the first time ... after learning what she knows at home. Tori developed a couple of weird little bumps during the extra hiking we did in July, while helping to look for a lost border collie. That too is a story for another day, but Tori's bumps weren't improving as much as I would have liked with at-home treatment. Was a now-vacated bot fly larva hole. Eeeeew! The veterinarian injected a little bit of steroids into each bump, and they are healing nicely. Whew! Until I'm ready to try handling both puppy-girls in the same agility class, I'm going to alternate which one I take to class each week, so it was Tori's turn again last week, and she did a pretty good job again at the courses, including FULL set of straight weave poles. So, What's Working to Prevent Tori's Extreme Car-Sickness? Then, about 30 minutes before we drive home again, we give her a second dose of both meds. She has successfully gone to town and back in my car (inside a crate) and in Tom's car (loose in the back with the seats folded down). She also gets extra points for the day we stopped for lunch at the local drive-in burger place and she didn't beg at all. She does seem fairly tired on the drives home, but it could be from the excitement of her adventures (as much as the meds). And, best of all, she can actually function at class and such ... compared to earlier attempts at taking her to classes as a puppy, where she would be so miserable that she'd drool and/or barf in the car (even on expensive prescription meds) and then curl up in a corner at class, even if we went way early so that she could have an hour to recover from the car before class started. I plan to start taking her up to drop-in classes with our main trainer in Boulder when I have time so that she can have more fun outings and practice being around strange people and strange dogs in new places. And, it looks like we'll have the opportunity to try dock diving soon (at the same place we take agility classes), so that could be SUPER fun too. ... but I'm working on a bunch of new plans for the blog, for new books, and more. Yay! Hi Roxanne and Tori! We have 6 dogs…well, 4 dogs and 2 border collies, ha!! They are something else again 🙂 I wanted to share a homeopathic remedy that my clients have found to be really helpful with their dogs who suffer from motion sickness – Cocculus. You can give this about 10 to 15 minutes prior to traveling and before you get in the car again. It sounds like you have a good answer but I did want to share this alternative too. Your book touched me deeply after the loss of my heart and soul guy, Andy, on Jan. 2nd. I’m an animal communicator and do know Andy is always with me but that doesn’t help the pain of losing the huge chunk of my heart that went with him. I’m going to write a book review for my Animal Soul Connection email family so they will know about your beautiful story. I’ve not heard of that one, Alison. I feel so relieved that we’ve finally found something that works for Tori. 3 years is a LONG time to avoid the car. Thanks for your kind note about the book too. I’m so sorry to hear about Andy. It’s nice that you can still feel connected through your communication efforts. Oh, Roxanne, I am soooo happy that Tori seems to be outgrowing her car sickness!! I remember Callie getting car sick on the way home from her puppy training class. She was always fine on the way TO class – or anywhere else – but after the 2nd upset, I figured out it was all the treats during class, plus the late summer heat outside. So, after the remaining classes, Sam and I always made sure to take her for a walk around the inside of the store (PetSmart) for about 20-30 minutes, and then walked to the car. By then, the treats had had a chance to digest a bit and she was fine going home. Thanks so much. I’m glad you found a solution to Callie’s car troubles. Each puppy/dog is so different. All we can do is keep trying, until we find just the right strategy or meds that work. On the plus side, at least our solution is relatively inexpensive … especially compared to the pricey prescription med that didn’t work at all for us.